Wine valuation guide - how to price wine | What is it worth? Gradually establishing itself as a popular auction category, wine is enjoying an increasing global demand in the last few decades. It is considered not only an enjoyment but also an investment, thus it is important to know how wine is valued, in order to buy and sell at the right price. Not every vintage wine is collectible and a rare bottle doesn’t necessarily mean it is valuable. We got together a list of attributes that determine the price of a wine. Sales history is the most important data that experts look at. To get a good understanding of the market, you should look through realized auction lots. Free and user-friendly, Mearto’s price database gets together an extensive range of bottles. Make sure you find the prices for lots that are the most similar to what you want to sell or buy. There are four attributes you should include in your search for most accurate results. Year: The year is important not only because it shows the age of the vintage wine but also some years are famously known to be better than others among the experts and that could greatly influence the price and investability of a wine. After these denominators are considered, the condition, provenance, and number of bottles in a lot influence the price. 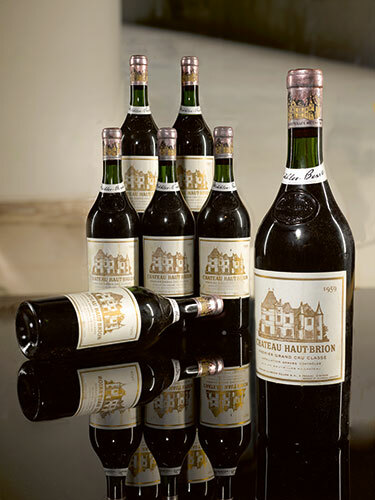 Château Haut Brion 1949. u. ms, label damp stained and spotted, cork very slightly raised. Price est. 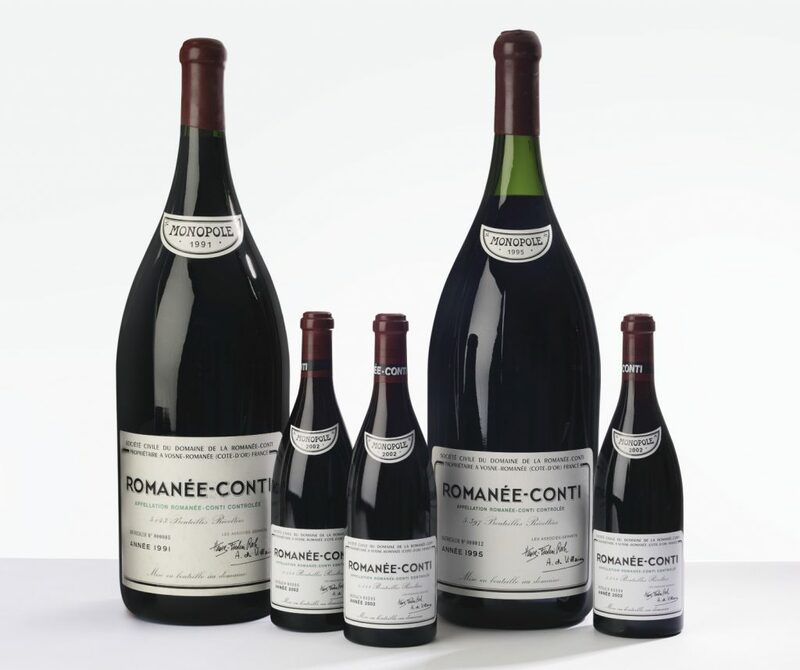 : £ 1,250 – 1,800 per bottle. Sotheby’s. Label Condition: Soiled, stained, cellar scuffed or worn label. Usually, a cosmetic concern but could give clues to the environment the bottle was exposed to. For example, a stained label might indicate the bottle was stored in damp conditions, which is usually good for wine preservation. So although the bottle might not look new, the wine might be exceptionally well preserved. Capsule and Seal Condition: The capsule is the protective sleeve covering the neck of the bottle and can be made of foil, plastic, tin, aluminum and in some older bottles lead. Sometimes sealing wax is used to cover the capsule. This wax can sometimes crack when the bottles are moved and cracked wax doesn’t necessarily indicate a problem with storage conditions. Original Unopened Packaging: If the wine bottles are in their original casing (cardboard or timber), then the experts wouldn’t open the box. In this case, you should take the provenance of the wine into account when determining the risk and value. MS = Mid-Shoulder. This level suggests usually some deterioration of the cork and therefore some variation and is usual for bottles 50 years or older. This is a high-risk category and should be valued accordingly if you are planning to drink this wine as opposed to obtaining it as a collectible. LS = Low Shoulder. A highly risky proposition for any age and values should be significantly lower to account for the risk. BS = Bottom Shoulder. Possibly a very interesting and rare wine with a low estimate. You will find the ullage level defined in the lot description, for example: (u. 3hs) means 3 bottles ullaged to high shoulder. For Burgundy, German and other wines in bottles with sloping necks the ullage are shown in centimeters, measured from the base of the cork. Example: (u. 2x5cm) means 2 bottles ullaged 5 centimetres. Similar to art, the provenance of a wine is a combination of its purchase and storage history. Some auction houses provide verified provenance guarantee or they might check the provenance of the bottle by sending an expert. Sometimes you will see a “Sample Tested” mark, which is the utmost guarantee about a bottle and also provides definitive taste description. There is only a small chance of finding someone willing to buy a single bottle of wine unless it is a highly interesting and rare example. If you have only one insignificant bottle of wine, it is best to prepare a nice dinner and enjoy it. The price of a bottle increases if it is possibly an investment wine. 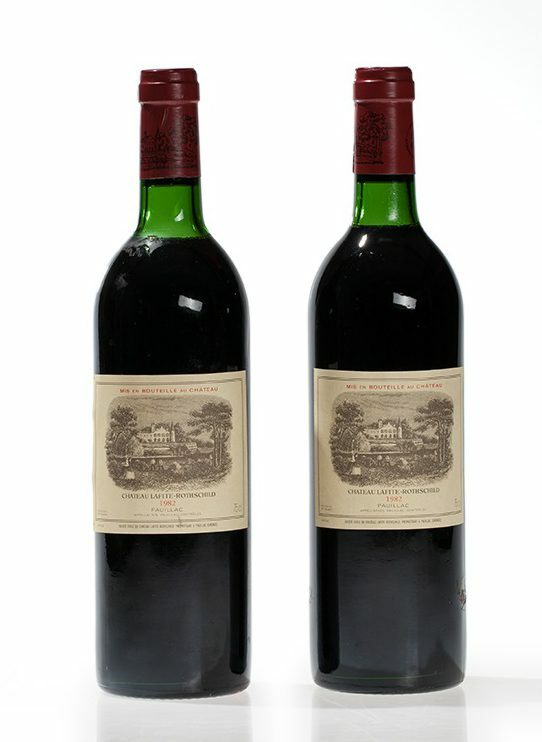 For example, the lot on the right, 2 exquisite Château Lafite-Rothschild sold for € 3,600 against an estimate of € 2,600 because 1982 was a special year for Bordeaux wine and this vintage was labeled an “outstanding wine that will get even better over the next 50 years” by prominent wine critics. For further information, stay tuned for our guide on wine investment! Cover image courtesy of Sotheby’s.